At the start of the book we meet a little sea snail who is full of wanderlust and longs to travel the world. He is not like all the other sea snails who seem content to stay on their one smooth black rock. So the little sea snail takes matters into his own hands (metaphorically speaking of course!) and uses his slithery trail to write a message on the rock – ‘lift wanted around the world!’. The message is answered by a huge humpback whale who allows the snail to travel with him on the tip of his tail. The pair than go off on a fantastic journey around the world – they see penguins and icebergs, fiery mountains and golden sands, and all sorts of fabulous things under the sea! In fact the pair is having a really fabulous time until one day it all goes horribly wrong – the whale loses his way and ends up lying beached in a small bay! The snail feels terribly small and helpless, but knows he has to go for help if the whale is to be saved. He crawls all the way to a school where he puts his slithery trail to good use once again by writing on the board – ‘save the whale!’ This alerts the children to fetch the fire brigade who manage to keep the whale hosed down and cool until the tide comes in again and the whale and the snail are able to swim away safely. After that narrow escape the whale and the snail return home where they tell everyone all about what has happened. All the other snails that they want to go on the next adventure and at the end of the story we see them all swimming off into the sunset! In my opinion this is a lovely story with a happy ending that is really well written. It is written in rhyme, as is the case in most of Julia Donaldson’s books, which give the words a gentle rhythm which you can’t help noticing as you read it. Also, this is great for children who are just becoming aware of rhyme because once they are familiar with the story they can help supply the rhyme. My three and a half year old loves being able to do this! 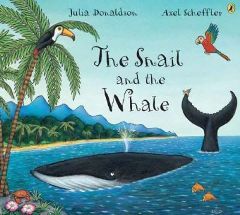 There are descriptions like these all through ‘The Snail and The Whale’ and they really help to create a vivid picture. These are, of course, accompanied by wonderful illustrations, which take the words and appear to make them come alive! We see ‘sharks with hideous toothy grins’, skies filled with ‘zigzag lightening’ and a beautiful ‘starlit sea’ to mention just a few of the wonderful pictures. All of these have so much detail that they can be talking points in their own right as well as helping to create the story. This gives the story a sort of familiarity as you read through it, and it also feels cumulative as though each thought and action is leading to the next. It’s also nice for children to be able to join in these repetitive lines. As for the content of the story, I think this is a lovely little tale with a good message. I like the thought that one so little can do so much for a creature that is so big. It goes to show that in many ways size doesn’t matter and it’s possible for creatures of all different shapes and sizes to live together and help each other. No Comments on "The Snail and the Whale"